GrooveSession is a true throwback and good old fashioned rock band uniting fans with a funky flare and positive message. Mind, body, and sound, GrooveSession brings a multi-genre blend of rock n’ roll that they call “movin' groovin' music.” A renaissance, a rebirth, an encompassed innovative flowering new sound on their quest to end the jammin' famine. Touring and playing over 1,333 dates while opening for and playing with many of today's greatest bands and musicians, there is something very special happening when GrooveSession performs. These guys love it all and you never know what you will get, but rest assured it’s going to be dynamic and musical. Tuned to 432Hz, this band is about the Earth’s natural vibration and healing properties that positive music and intention bring to life! Magical, professional, and musical with the ability to make fire with music! GrooveSession is made up of brothers, Manny and Ronnie Sanchez, and Sarven Manguiat. Night Animals is a six-piece funk band from San Francisco, CA dedicated to the mission of transforming stages into full-blown celebrations of the night. 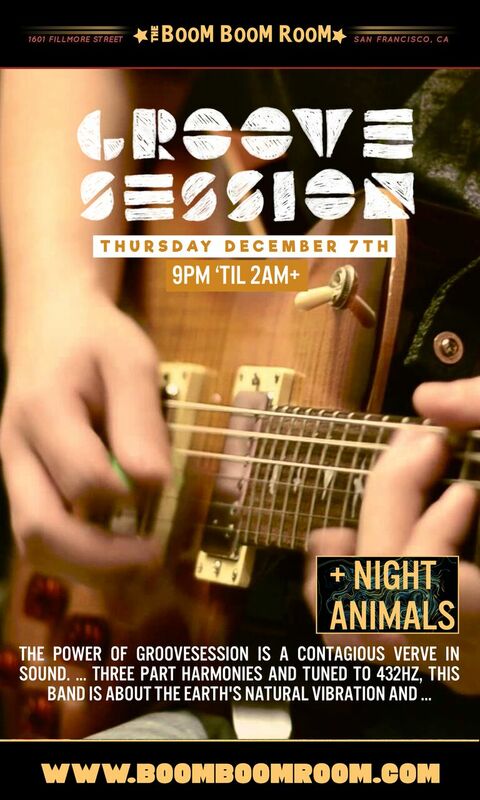 Featuring Jay Costa (guitar/vocals), Kevin Coleman (drums), Matt Kane (saxophone), Will Skinner (trumpet/vocals), Jason Tharp (bass), and Derek Wetzel (keys/vocals), live performance is the pinnacle of Night Animals' music, combining high-energy compositions with a love of improvisation and an undying commitment to stage performance. With seductive vocals, serpentine horn lines, hypnotic rhythms, and hook-laden guitar licks all conspiring to put you under their spell, by the end of the night you may well find yourself howling at the moon.